Javier Gorosterratzu was born in 1877 in Navarra. When he was 16 he joined the Redemptorists, and he was ordained a priest in 1903. Father Gorosterratzu taught in Burgos and León and was renowned as a popular missionary and an expert confessor and spiritual director. He was the author of two historical works and a manual of philosophy. On August 10, 1936, he was arrested by the militia of the Popular Front and shot in the cemetery of Cuenca. Before he died, he forgave his killers. Ciriaco Olarte was born in 1893 to a very religious family in Álava. His family encouraged him to consider the priesthood, and he joined the Redemptorists in 1904. He was ordained in 1917 and three years afterward went to Mexico as a missionary. He returned to Spain in 1926 and ministered in Madrid until May 1935, when he moved to Cuenca. On July 31, 1936, he was arrested, taken to the place called “Las Angustias” (Sorrows), severely wounded, and left to die. Miguel Goñi was born in Navarra in 1902 and as a child expressed the desire to become a priest. He joined the Redemptorists in 1918 and was ordained a priest in 1925, despite poor health and extreme shyness. He became a popular and tireless mission preacher. 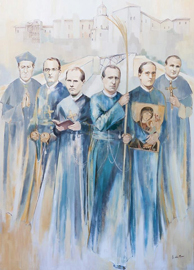 In 1932 he was transferred to Cuenca and ministered especially in the parish of St. Phillip Neri. He was arrested by the militia, shot, and left to bleed to death on August 31, 1936. Julián Pozo was born in Álava in 1903 and entered the Redemptorist seminary in 1913. There he was known for his deep spirituality. He was ordained in 1925, despite having suffered from tuberculosis since 1921. He was widely known for his serene disposition and great gifts as a confessor and spiritual director. He transferred to Cuenca in 1928. On August 9, 1936, he was arrested while praying the rosary. He was shot and killed along the road from Cuenca to Tragacete. Pedro Romero was born in Burgos in 1871. He entered the Redemptorist school at El Espino and was ordained in 1896. Because of his shyness, he was not drawn to missionary activity but instead devoted himself to meditation, prayer, mortification, and the ministry of reconciliation. When the Spanish Civil War broke out, he lived with a local family and went begging in the streets in order to continue his apostolate. In May 1938 he was arrested and imprisoned, dying of dysentery in prison on May 29. Victoriano Calvo was born in Guadalajara in 1896 and early on showed a distinct inclination to the spiritual life. His family were reluctant, however, and in 1919 he ran away from home to join the Redemptorist community. He made his profession in 1920 and the following year was assigned to Cuenca, where he served as a clerk and porter. He also provided spiritual direction for young women and was known for his asceticism. On August 10, 1936, he was arrested and shot in the Cuenca cemetery along with Father Gorosterratzu.